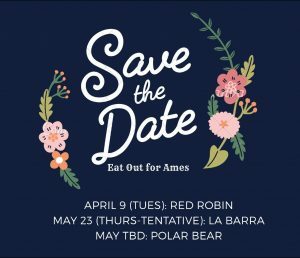 Thank you to everyone who has been supporting our Ames Eats Out Nights. These events help raise money so we can have things like Pizza with the Principal and the great school assemblies. Plus it’s a great way to get our school community together. We have 3 more Eat Out Nights for the School Year. Please save the date. More details to come on the LaBarra Event! It’s going to a ton of fun!